High Resolution Raman Microscope. 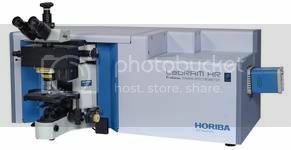 The LabRAM HR Evolution systems are ideally suited to both micro and macro measurements, and offer advanced confocal imaging capabilities in 2D and 3D. The true confocal microscope enables the most detailed images and analyses to be obtained with speed and confidence. With guaranteed high performance and intuitive simplicity, the LabRAM HR Evolution is the ultimate instrument for Raman spectroscopy. Ideal for Bio-chemical applications: Unique inverted Raman microscopy with true confocal spatial resolution and fluorescence optical imaging modes. Specialised NIR laser wavelengths are optimised for biochemistry and life science. 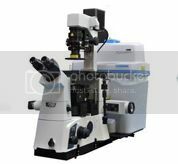 The XploRA can be coupled to both upright and inverted microscopes, allowing analysis of all sample types, ranging from semiconductors and nano-materials, through to biological cells and tissues. Combining microscopy and chemical analysis, the XploRA™ retains the full functionality of your microscope coupled with high performance Raman spectroscopy. Compact and rugged in design, the XploRA™ is easy to use and transport due to its minimal footprint, making it the ideal smart microscope for every R&D, QA/QC and forensic lab. Now you can explore the true nature of your sample with rapid compound identification and chemical imaging, with no sample preparation and analysis in normal ambient conditions. This non-destructive technique of analysis will transport you into a new dimension of microscopy. Intuitive operation through new fully compliant software modules including GO!™ Guided Operation wizard ensures complete ease of use and gets you up to speed immediately. Upright - for materials and forensic applications, including semiconductors, nano-materials, minerals, forensics, pharmaceutics etc. Inverted - for life science applications, including cell imaging, characterization of drug-cell interations. SWIFT for ultra fast raman imaging.Plug and play operation.